The Wicked Lite updates Mountain Hardwear's excellent Wicked-T, remaining one of my top choices for big days climbing, hiking, and skiing in the Eastern Sierra. Made from a soft, open 'jersey mesh' polyester, the Wicked Lite is comfortable and cool against the skin—and light, weighing a reasonable 5.3 ounces in men's medium. I particularly like the Wicked Lite for climbing in warmer conditions that would normally necessitate a cotton top. The Lite keeps you cool enough, and dries very quickly once the temperature drops. This is a technical top, to be sure, with a variety of important details that make it an excellence choice in the backcountry. Among them: the Wicked Lite uses offset seams and a low-friction exterior to make the shirt especially comfortable when wearing a backpack. The Wicked shirt also does an outstanding job of evaporating off moisture. Get the Wicked wet, and it dries out as fast or faster than any other synthetic fabric I've tried. Oddly enough, this can be a bit of a liability in extremely warm weather: you may find the Wicked Lite evaporates sweat so efficiently you'll need to drink extra water to keep up. 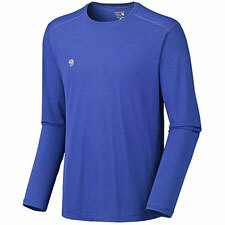 The Wicked Lite comes in long and short-sleeve versions; I prefer the long-sleeve, for extra sun protection. Despite the fabric's open mesh, Mountain Hardwear says the Wicked Lite has a sun protection factor of 35—easily better than cotton. In addition to using it as a stand-alone top, you can of course wear the Wicked Lite as a base layer as well. The mesh fabric's very low friction coefficient keeps it from snagging or bunching up beneath your other clothing layers—again, enhancing comfort. The Wicked Lite comes in a variety of colors, though not, unfortunately, in white. For warm weather, of course, pick the lighter colors. There are newer synthetic shirts out there (like Arcteryx's Motus Crew) that offer more specialized performance, albeit at a considerably higher price. As a general-use hiking and climbing shirt, however, the Wicked Lite remains hard to top—excellent performance and a very reasonable price. Absolutely one of my favorites.